Nigeria Declares State Of Emergency In 3 States : The Two-Way Nigeria has been accused of doing "too little, too late" to stem militant Islamist violence, and President Goodluck Jonathan has acknowledged he's not fully in control. 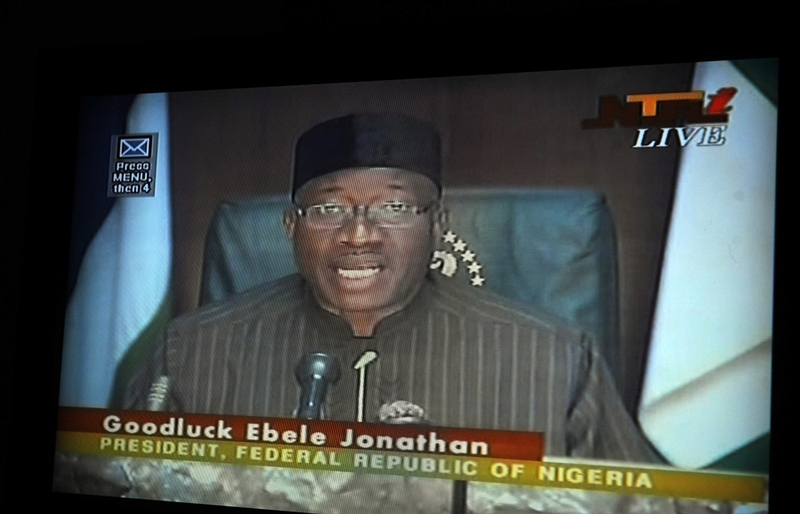 Nigerian President Goodluck Jonathan declares a state of emergency during a live broadcast on state television on Tuesday. Nigerian President Goodluck Jonathan imposed states of emergency in three states Wednesday, promising to send more soldiers to the northeast to put down a growing threat from militants from the Islamist group Boko Haram group and an offshoot, Ansaru. NPR's Ofeibea Quist-Arcton says Borno, Yobe and Adamawa states, which are close to the Chadian border on the east, are beset with violence. Militants are threatening to impose strict Islamic law in the region, and are establishing control with more sophisticated weaponry. Ofeibea says Nigeria has been accused of doing "too little, too late," and that Jonathan has acknowledged he's not fully in control. According to Reuters, officials say militants control at least 10 government areas in the state of Borno, where fighters overran the town of Bama last week, freeing more than 100 prisoners and killing at least 55 people. A few days before that, dozens of people reportedly died in the town of Baga, on Lake Chad. Nigerian troops, aided by troops from Niger and Chad burst into the town looking for guerrillas. Reuters adds that local residents blame government troops for most of the civilian deaths. There also are reports of many more deaths at the hands of Nigerian government troops. Last week, The New York Times reported on the soaring number of bodies brought to the morgue in the city of Maiduguri, in Borno state. As many as 60 bodies may arrive in a single day. "The corpses were those of young men arrested in neighborhood sweeps by the military and taken to a barracks nearby. Accused, often on flimsy or no evidence, of being members or supporters of Boko Haram — the Islamist militant group waging a bloody insurgency against the Nigerian state — the detainees are beaten, starved, shot and even suffocated to death, say the officials, employees and witnesses." Nigerian opposition groups have denounced the new states of emergency, instead insisting that the government continue trying to talk to Boko Haram leaders, with an eye toward a possible amnesty for militants. "The declaration of a state of emergency may be linked to proposals of an amnesty for Boko Haram–the amnesty would play the carrot to the state of emergency's stick. Jonathan earlier established a committee to explore the modalities for a possible amnesty. Thus far, however, Islamist spokesmen have shown no interest. Over the weekend an alleged Boko Haram spokesman said that there would be no talks unless or until the government released the Boko Haram women and children it is holding. Islamists are themselves now kidnapping women and children, apparently holding them as hostages for the release of their own." According to The Associated Press, human rights groups accuse the Nigerian government of arresting the wives and children of criminal suspects.